A dark warrior strong in the Force, Kylo Ren commands First Order missions with a temper as fiery as his unconventional Lightsaber. Wait, the "First Order" is a military group? I thought it was just a catchy name for the initial shipments of toys. Rustin's all "I found a First Order Flametrooper" and I'm like "I'm okay waiting for later shipments, I'll get a Flametrooper then." It's okay, that's not really a spoiler - there were a lot of worse things they could have revealed, like the fact that "Kylo Ren" is secretly Mace Towani, the little kid from the Ewok movies who was left for dead on Endor. He happened upon Vader's funeral pyre, which is why he has the burnt helmet. Now that's a spoiler! Mylo Xyloto is the new Sith for the new movie. You can tell, because he wears all black and wields a red lightsaber, which is de rigueur for the Dark Side. If you pull back his (softgoods) hood, you'll see that he wears a neat helmet, not just a facemask - it looks a bit like a German WWII helmet, though it comes down lower in the back. The silver ridges around the eyes and the solid black pad over the nose and mouth really make him look ready for a total raging game of paintball, brah! The rest of Kylie Jenner's robes are, well, robes. There's a plastic... scarf? shawl? cape? draped around his shoulders, and a plastic belt around his waist, but his actual outer robe is softgoods. It looks slightly better here than on Emperor Palpatine, so that's a plus. Besides, it's not like they could have sculpted it, the way they did on Darth Maul - the figure's legs would never be able to move. Or would they? 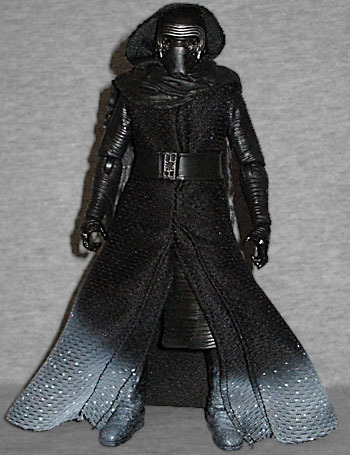 He's got an under-layer of robe, which is molded from soft PVC, and that doesn't get in the way much. His arms are fully sculpted, with sleeves that might be ribbed material, or might be wrapped like bandages. His right hand is molded to hold his lightsaber, while his left is in a "Force using" pose. 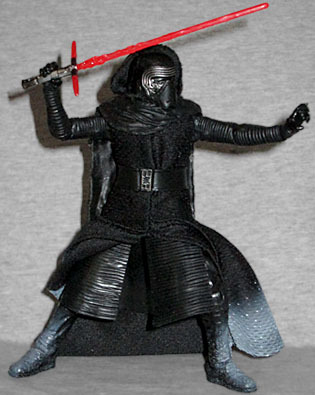 Like all his Black Series brethren, Phyllo Dough has a lot of good articulation. 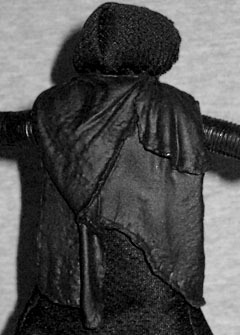 His head is a balljoint/hinge, though the scarf dealie really keeps the hinge part from going anywhere. All the joints in the arms are swivel/hinges, and he has a balljointed torso. The hips are balljointed too, and he's also got swivel thighs, double-hinged knees, and swivel/hinge rocker ankles. Those are all the same points as the normal figure, and enough to get him into his already-iconic "watch me light my saber in this forest" pose. Eagle-eyed readers will have noticed that we said "the normal figure," meaning that, yes, this is a variant. And an exclusive, no less! Only available at Kmart, of all places, this version of Filo Pilo has a few differences to set him apart. For instance, the "Force choke" hand. That's a new mold. But more notable is the large snowy base he comes with. It's 6¾" long and has two deep holes that his feet fit into. There are no pegs or anything, just crushed snow (which shows us that the bottoms of his boots are supposed to have squarish treads). It's a nice enough piece, and definitely explains why his boots and the lower edge of his robe have been given a frosty effect. Sadly, the early reports about this movie's villain being Sgt. Squid (a part-cyborg Mon Cal who could hold 10 lightsabers at once) turned out to be incorrect. But never fear, Rilo Kiley still gets a silly and impractical weapon! Granted, it's not as ridiculous as the blades used by the Inquisitors on Star Wars: Rebels, which seem to be based on a toy, but still. When the trailer came out, everybody made fun of the tiny lightsaber-blade quillons, but you have to admit, they make this weapon distinct. 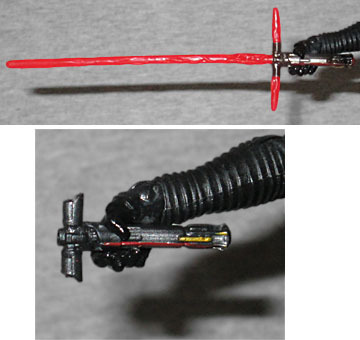 The accessory included with Luke Skywalker's son is a new mold - the mass market version tried to make a removable blade by connecting all three beams, but it didn't look very good. This one ignores that feature completely, in favor of making the weapon accurate. If you want an unignited lightsaber, the set comes with the hilt from the previous release. The standard Black Series figures cost about $20. This one, being an exclusive, costs $25. But with the inclusion of the display base and the accurate lightsaber, it feels like you're getting your money's worth. Or at least, you're getting enough stuff to add $5 to the price of a figure, even if that figure's starting point was higher than it should have been. Forget the plain Kylo Ren, get this one instead.